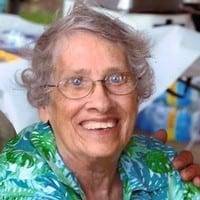 Kay Ellen Johnson, age 80, of Bryan, Ohio, passed away at 9:30 A.M. on Friday, March 15, 2019, at Hillside Country Living near Bryan. Mrs. Johnson was a lab technician at the Defiance Clinic, owned a bridal shop and babysat for many years. She was a former member of St. John United Church of Christ in Defiance where she taught Sunday School and was a member of the Beta Sigma Phi sorority. Kay enjoyed sewing, needle point and reading. Kay Ellen was born on June 29, 1938, in Paulding, Ohio, the daughter of Murl M. and Marjorie C. (Gunderman) Krick. She married Paul R. Johnson on August 8, 1959, in Paulding, Ohio, and he preceded her in death on February 21, 2018. Kay is survived by one daughter, Elaine M. (Jeff) Wirick, of Sherwood, Ohio; three sons, Kevin P. (Tamara Branstetter) Johnson, of Bryan, Chad (Shelly) Johnson, of Bryan, and Kyle (Allison) Johnson, of Fort Wayne; nine grandchildren; ten great-grandchildren; a brother, Murl (Linda) Krick, of Paulding and a nephew, Daniel Krick. Visitation will be held on Monday, March 18, 2019, from 3:00-8:00 P.M. in the Krill Funeral Home, 860 West Mulberry Street, Bryan. Funeral services will be held on Tuesday, March 19, 2019, at 10:30 A.M. in the Krill Funeral Home, Bryan with Pastor Mary Beth Smith-Gunn officiating. Interment with follow in the Farmer Cemetery. Be the first to comment on "Kay Johnson (1938-2019)"